The English Language tests are meant for students who are aspiring to study at a higher education institution abroad. The test scores are required since an undergraduate, graduate or postgraduate aspirant needs to show their proficiency and demonstrate their ability to communicate in the language of instruction of the programme they wish to attend. English Language Proficiency is one of the most important requirements for academic programmes abroad. For English language proficiency, aspirants can take any of the renowned exams such as IELTS. 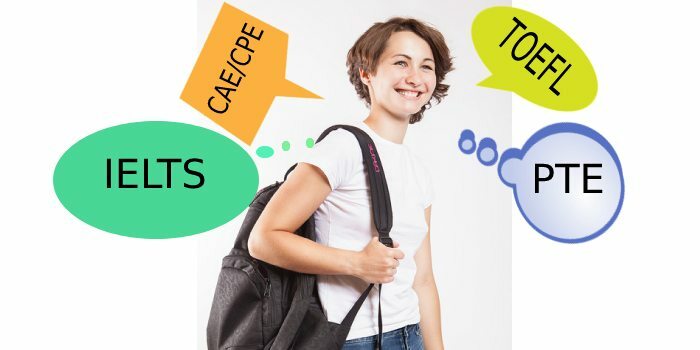 TOEFL, CAE, PTE. Some of these exams like TOEFL can be taken internet-based (iBT) or paper-based (PBT). Universities around the world have a mandatory requirement from international students who are not from English speaking countries to send in their English language proficiency score to be considered for admissions. Universities have different English language proficiency eligibility criteria for undergraduate, postgraduate and scholarships. The eligibility for scholarships is higher than the eligibility for undergraduate and postgraduate admissions. Some courses like law and medicine have different eligibility criteria as well. For Masters programme abroad, aspirants are required to appear for GRE/ GMAT as well as any of the university prescribed English exam like IELTS, TOEFL, PTE, CAE etc. Some universities may not ask for a GRE or GMAT score, but English Language Proficiency is deemed mandatory. Besides the GRE or GMAT scores, all universities give a lot of weightage to the English scores for admission. Failing to achieve the prescribed score often leads to rejection by the universities or in some cases, the aspirants are required to take extra English courses to make up for the loss. Australian universities are very sought after for engineering programmes from aspirants from all over the world including India. The English Language Proficiency are the minimum scores required by the universities. Candidates with a higher score are preferred. North America leads the world in to universities. The region not only provides world quality education, it also provides the most coveted jobs in the world. The top universities of USA are the top universities of the region. As predominantly an English speaking region, USA attracts students from all over the world and hence requires the students to have a certain level of English Language Proficiency. The scores mentioned are the minimum scores. Applicants scoring more than the minimum score obviously are preferred above the lower scoring candidates. Australia has seven of the top 100 universities of world. The top universities in Australia have been providing world-class education, and catering to students from all over the world. Australian Universities also offer a number of scholarships for students aspiring to study. The universities of Australia have a mandatory English Language Proficiency proficiency requirement from students applying to study. 176 overall with at least 169 in all sub skills. European universities are some of the best in the world for graduate programmes in Engineering. Four of the top 10 universities for Engineering and Technology are present in Europe. European universities feature in the top in a number of Engineering disciplines. Most graduate engineering programmes in Europe are taught in English making a language proficiency score mandatory. The top universities of UK are among the top universities of Europe. Grade A or B (with at least 193 in each individual element) plus a language centre assessment. overall band score must be at least 7.0. The number of students opting for doing their Masters from Asia are growing. The continent has the two of the three largest economies of the world making it not only good for education but also for a job. The top universities of Singapore top the lists of universities in Asia. 6.5 for overall and 6.0 for writing component). English is the main language of instruction of most Masters programmes in Engineering all over the world. Aspirants who have completed their basic education from some countries listed by the universities are also exempted from taking the English Language Proficiency exams. The list of countries include some Caribbean countries, Australia, Canada, Fiji, some African countries, Guam, Ireland, Mauritius, New Zealand, Seychelles, Singapore, a few British overseas territories, United Kingdom, and United States of America. Universities may add or remove any country from the list. All English tests have similar components. The importance given to each section and their scoring pattern is different. For example, the reading section of IELTS is 60 minutes long. The test comprises of three reading passages and tasks related to the passages. The tasks also have diagrams, graphs and illustrations. The TOEFL (iBT) reading section on the other hand is of 60 – 80 minute duration. It comprises of 36 – 56 questions and asks the test taker to read 3 – 4 academic texts and answer related questions.